Wrap Around Balcony Archives | King Rentals, Inc.King Rentals, Inc.
Beautiful beachfront living with panoramic ocean views from the second floor wrap-around balcony. Enjoy all the comforts of home with a fully equipped kitchen, a washer and dryer in unit, and internet service. This property includes 2 Queen sized beds, and 1 sleeper sofa for your convenience. The spacious floor plan includes an eat-in kitchen, large living and dining room overlooking the ocean, a master suite with a walk-in shower and plenty of closet space, a guest bedroom, and a den with a sleeper sofa. This is the perfect beach getaway! The Windrush complex offers many amenities including, a heated swimming pool, a hot tub, and tennis courts for your leisure. Great location just north of Downtown Cocoa Beach, easy access to area amenities, and a short drive to Orlando. Located in the exclusive Solana Lake community, this beautiful 3rd floor condo offers sweeping views of the lake from the wrap around balcony and all the amenities of home including a fully equipped kitchen and laundry in unit. Enjoy indoor/outdoor living with two balconies, a spacious floor plan with modern decor, and a master suite complete with a walk-in shower and garden tub. Solana Lake has many onsite offerings such as a pool, hot tub, and clubhouse as well as a community beach access. Conveniently located near Port Canaveral, area amenities and attractions, Downtown Cocoa Beach, and just a short drive from Cocoa Village, Patrick AFB, Kennedy Space Center, Melbourne, and Orlando areas. Open, bright and airy, spacious three bedroom penthouse at the luxurious Puerto del Rio complex. This unit boasts panoramic views, smart furnishings in mint condition, a fully equipped kitchen, and wrap-around balcony. 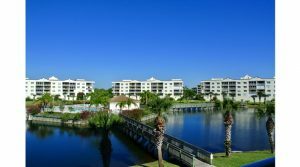 The complex offers a pool and exercise room, and is conveniently located near Port Canaveral, area shopping and dining, and beautiful Cape beaches. Located at the pristine Flores Ocean Suites, this two bedroom, two bathroom corner unit offers panoramic views of the Atlantic Ocean and beautiful Cape beaches from the fourth floor wrap around balcony. The oversized sliding glass doors ensure stunning views from every room. The unit is professionally decorated and offers all the comforts of home with a fully equipped kitchen and laundry in the unit. The complex has a secured lobby, garage parking, and a heated pool and hot tub. 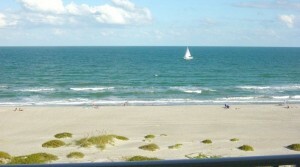 Conveniently located near local amenities, Port Canaveral, and all the Space Coast and Orlando have to offer. Located at the beach front Sandcastles condominium community, this luxury three bedroom/two bathroom unit boasts beautiful wrap around views of the ocean from its 6th floor balcony. 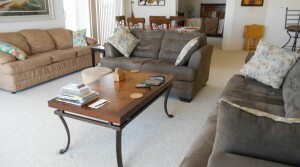 The complex offers beach access, a heated pool, a hot tub, an exercise room, and tennis courts. Unit #605 features a fully equipped kitchen, laundry in unit, and internet access from a central location in Cocoa Beach that is perfect for exploring the Space Coast and Orlando areas.